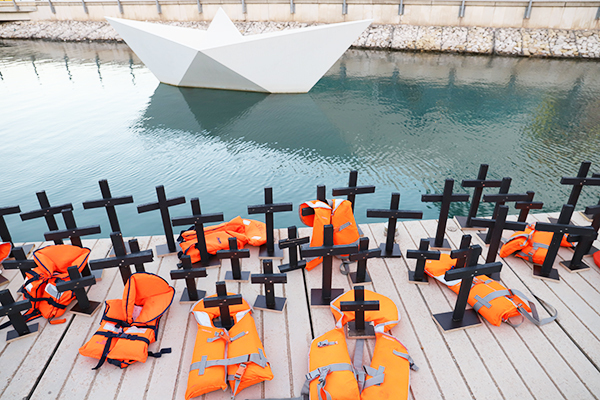 Remembrance of the deceased refugees in Malta. “Allow the rescue ships stationed in Malta to head for the high seas again and the Moonbird to resume its aerial reconnaissance flights!” With this urgent appeal, Präses Manfred Rekowski, chair of the advisory commission on migration and integration of the Evangelical Church in Germany (EKD), concluded his visit to Malta. He called on governments and political leaders in Europe to stop breaking international law and criminalising civilian rescuers of persons in distress at sea. Policy-makers should also understand that the thousands of deaths at Europe’s southern borders are a humanitarian disaster and a political responsibility. Speaking to the Maltese press and media yesterday evening in the port of Valletta, Rekowski again defended civilian sea rescue operations. “As Christians who recognise in Jesus Christ the needy person, the refugee, the human, we will continue to advocate for humanity,” he declared in a statement headed “Watch and pray” (Mt 26:41). The EKD will continue its active support for refugees in distress at sea and their rescuers, he announced. The Facebook page of the EKD and the Facebook page of the Evangelical Church in the Rhineland are reporting live and church president Rekowski is posting reports of his trip on his blog. All channels plus photos, reports and videos are linked or accessible at ekir.de/malta.